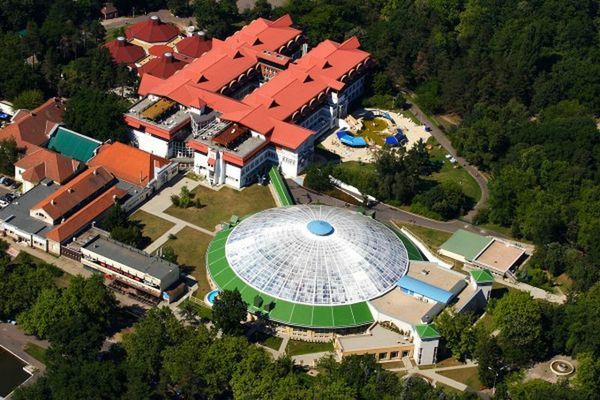 The Thermal and Wellness Hotel Aquaticum is located in the city of Debrecen, in a nature conservation area, just in the heart of the Great Forest. The hotel offers 94 rooms and apartments, all with air-condition, bath tub, hair dryer, telephone, TV, radio and minibar, rooms for handicaped guests are also available. All rooms are with fitted carpet or parquet, also with balcony. Conference facilities for up to 400 persons. The thermal bath was renovated completely in 2002. 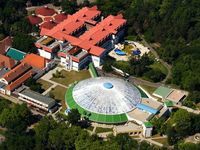 It is located directly next to the hotel in the imposing dome hall, with a rotating-bath, two steam chambers with various temperature, and four thermal pools with different fun elements. The outside pool is open also in winter. The indoor swimming pool awaits the guests with its 33 meter long and 12.5 meter widr indoor bath every day except for the summer period (from June to August). In summer the 50 meters long outdoor pool of the lido offers excellent swimming possibility. Open: from September to May, every day 6.00 to 19.00. The indoor water centre - open all year around - combines the experience of a summer slide park with other water attractions already available in many other baths. The water centre, under a 66 meter diameter dome, is filled with the multiplicity of tropical plants and offers a real summer mood with its agreeable temperature. The two open-air thermal water pools, a wave pool, a 50 meter filtered swimming pool and two children's pools await guests who want to splash. On the area of the bath there is a streetball ground, foot-tennis grounds, a sandy football ground and a beach volleyball ground. Open: from May to September, every day 6.00 to 19.00. • Full board is available at 4600 HUF per person. • Using the Internet connection costs 990 HUF per day. • Rates exclude tourist tax (300 HUF per person per night).